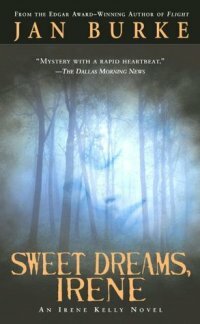 “Sweet Dreams, Irene” is the second in Jan Burke’s series of mysteries starring intrepid newspaper reporter Irene Kelly. It begins with Irene reporting on the two men running for D.A. One candidate’s political machine accuses the other candidate’s son of being a Satanist. The boy comes to Irene to try to get his side of the story in the paper, insisting that rather than being a Satanist, he’s actually trying to get his best friend to leave a Wiccan coven. Before we know it, there are dead people, there are death threats, and then Irene winds up kidnapped. Even after she escapes (okay, sorry, that was spoily, but since there are a lot more Irene Kelly books after this, you know she didn’t stay kidnapped forever), Irene keeps having nightmares about her captivity. She expects this to put a strain on her relationship with Detective Frank Harriman, but the two of them are too busy finding out who’s behind all the murder and mayhem to stay apart for long. This book was written in the mid-’90s, when Wicca was a hot new topic that would have raised a lot of eyebrows. Now it feels a little bit like the subject of witchcraft was included for shock value and timeliness, which makes the whole book feel a bit dated. However, the interpersonal relationships and the detective work more than make up for that. Irene Kelly reminds me of Nancy Drew — she’s intelligent, feisty, loyal, and daring. She can get herself out of most jams, and when she can’t, her wonderful boyfriend can. Like Nancy’s Ned Nickerson, Frank Harriman is strong, handsome, athletic, and sympathetic. I look forward to reading more of this series, and am very glad to know there are almost a dozen of them so far.